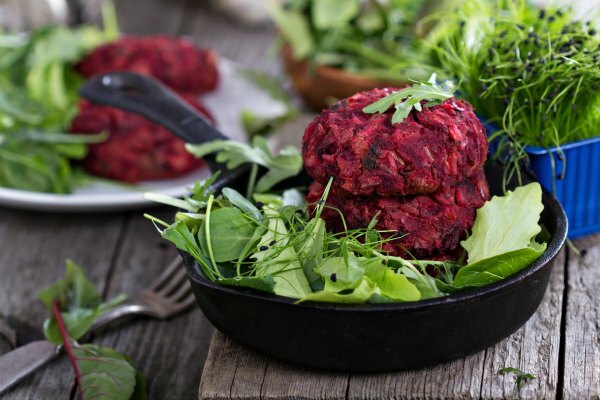 There are soooo many recipes out there for plant-based burgers, and you know what… most of them don’t work out! They taste awful or don’t stick together. This one though… this one actually works and is full of texture and flavour!!! 2. Scrub and grate the beetroot. Finely chop the spring onions, grate the cheddar and crumble the feta. 3. Heat the oil in the pan and add the beetroot and spring onions. Cook for about 5 mins over a medium heat, stirring. 4. Put the beetroot mixture into a medium bowl with both the cheese, mint, ProMix, oats and the lemon juice. Mix well using your hands. Add some black pepper and a pinch of salt. Form into burger shaped patties. « Back to school! Create new habits.